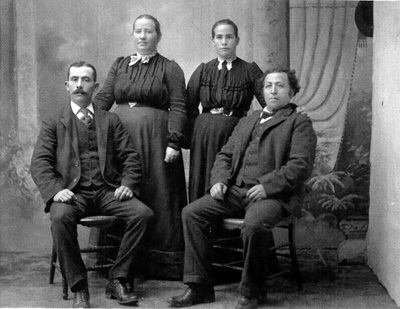 ​By 1903, the Pfenning family had arrived in Portland, Oregon where their other children, Pauline, Flora and Louis were born. Pauline and Flora survived. Louis died at birth. Another family tradition is that Louis was the first baby that Pearsons Mortuary took care of. His father took a taxi to Rose City Cemetery and held the small casket in his lap. The house that John and Mollie built is still standing on NE Grand Avenue between Failing and Shaver. Henry and Katherine stayed in Nebraska and raised a large family. Another family story says they came for a visit to Portland and she didn't like it here and made them move back to Nebraska. 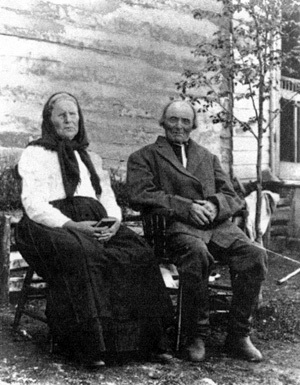 Photo at left: Nicholas Pfenning, born 28 Sept 1844 in Norka, Russia with his second wife, Katherina Maria Hartum (Hartung?). Photo taken in Stony Plain, Alberta, Canada prior to 1925. Photo at right: The Pfenning Brothers from Norka. Johannes (John) and Heinrich (Henry) Pfenning , seated. Amelia (Mollie) Schwartz) and Katherine Gerlach, standing. Picture taken probably in Lincoln, Nebraska after 1892. John and Mollie left Norka in 1892 and arrived in America in early 1893. They arrived with one son, Henry who was born in Norka. They had a son John and daughter, Elizabeth born in Nebraska. They moved for a short time to Mississippi and John died there. Family story is that his high chair was knocked over by visiting cousins and he died as a result of the fall. Story and photos courtesy of Marcia Lincoln Staunton, March 2006. Last updated March 12, 2016.